With this in mind, in this post, we’ll walk you through a step by step tutorial on how you can share your RSS feed with your readership. We’ll also recommend some of the best, free RSS plugins for WordPress that you can use to get started. What Is the WordPress RSS Feed? Really Simple Syndication (RSS) has been around for nearly two decades now. RSS is basically a type of web feed that allows readers to manage content consumption by aggregating the latest publications from their list of favorite websites on a single platform. When a user subscribes to your website’s RSS, they no longer have to keep checking your site for new content. 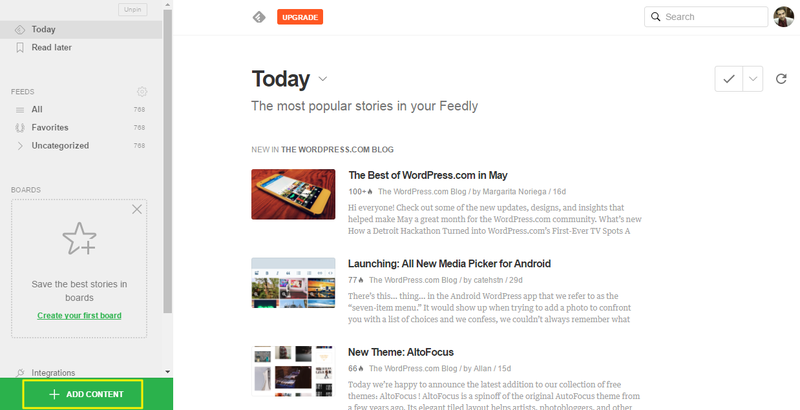 Instead, whenever you publish a new post, it will automatically show up on the user’s RSS reader. Find out how you can get more loyal readers by sharing your #WordPress #RSS feed! One of key reasons behind the popularity of RSS feeds is that you don’t have to worry about compatibility problems. 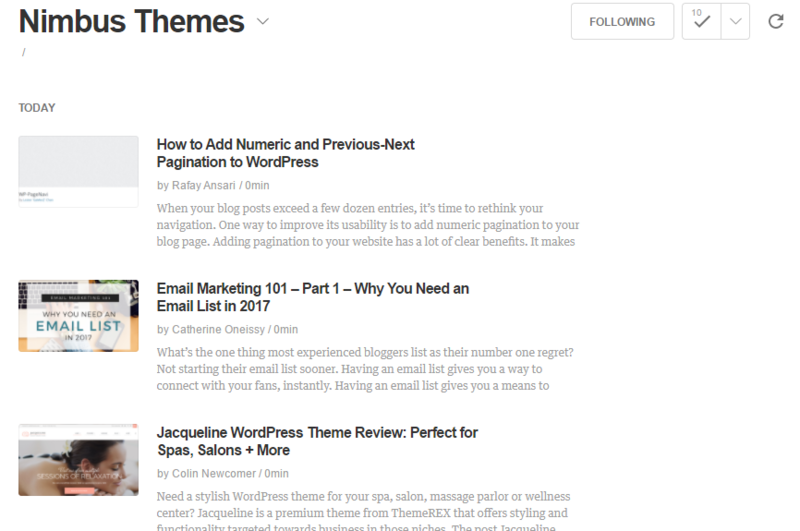 Most RSS readers will extract the text and images from your blog post and display them in their default layouts. In addition to this, RSS technology allows readers to filter the content that’s delivered to them. For instance, if you’re only interested in receiving sports updates from your favorite news website then you can configure your RSS reader to only pull new content from the Sports section. WordPress generates an RSS feed for your blog posts and comments – automatically. Most WordPress themes also send the blog posts’ meta data through which allows the user’s RSS feed readers to discover the feed and accurately pull content from it. 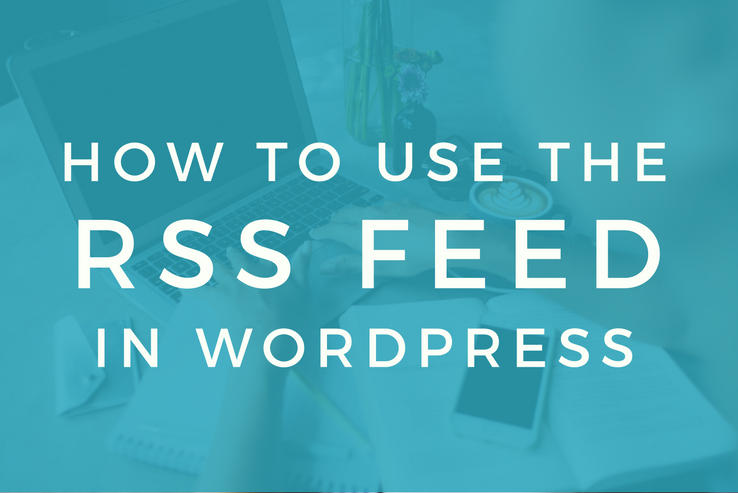 Now that you have a better idea of what RSS feeds are, let’s take a look at how you can share your own WordPress RSS feed with your site’s readership. How Can I Share My WordPress RSS Feed With Viewers? As we briefly mentioned in the previous section, WordPress automatically generates an RSS feed for your blog posts. This means that anyone with an RSS reader (or aggregator) can configure your latest posts to be delivered directly to their device. All you have to do is make sure your RSS feed URL is visible to your site’s readers. Most websites display the RSS feed icon along with other social media icons in their site’s header, sidebar, or footer. There are two RSS feed settings available in WordPress right out of the box. 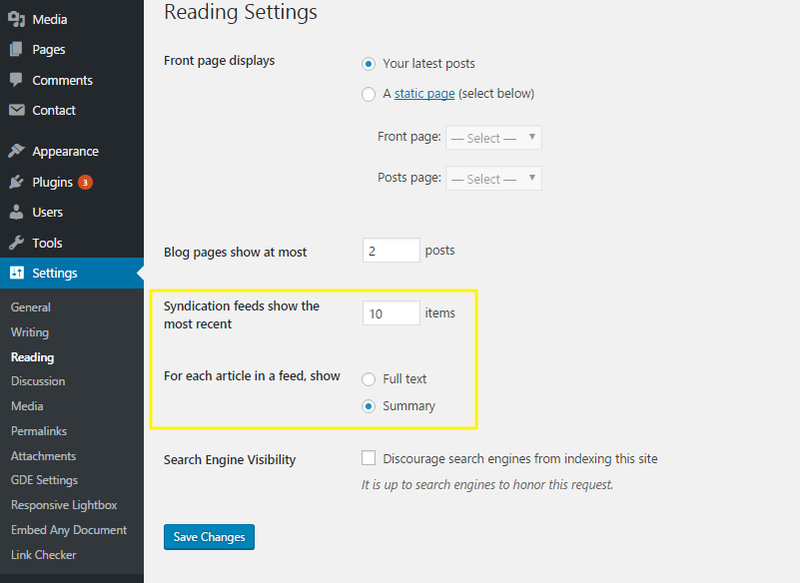 You can access and configure these by navigating to the Settings > Reading from the WordPress dashboard. The first option lets you decide how many feed items you want to display. And the second option lets you choose whether you’d like to display the entire blog post (Full text) or an excerpt (Summary) in the RSS feed readers. For the purpose of this tutorial, we’ve decided to show the summary of the ten most recent blog posts in the RSS feed. Be sure to hit the Save Changes button once you’re done. WordPress doesn’t have any built-in options to let you promote your RSS feeds on your websites. In order to share your WordPress RSS feed with viewers you’ll have to promote the feed’s link so that your readership can subscribe to it by adding it to their RSS feed reader. Most websites use the orange RSS icon (shown above) to link to their RSS feed and it is still one of the best ways to get your site’s readers to subscribe to your RSS feed. The Jetpack plugin comes with an RSS module that lets you set up an RSS subscription section on your website. In addition to this, some social sharing button plugins also have an option to display the RSS icon. Once you have the RSS feed enabled and configured on your website, your site’s readership can simply access your feed items using an RSS feed reader. 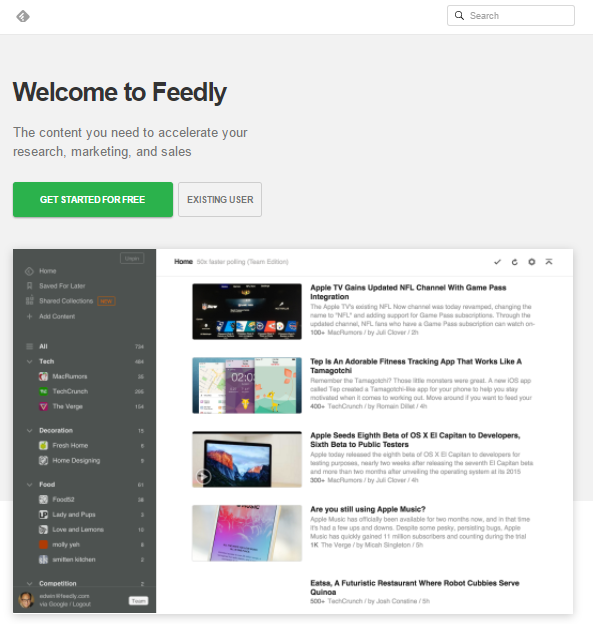 We recommend Feedly – a web-based RSS reader – that lets you set up your RSS feed within your browser. As a bonus, it also has a mobile app for users who like to consume content on the go. 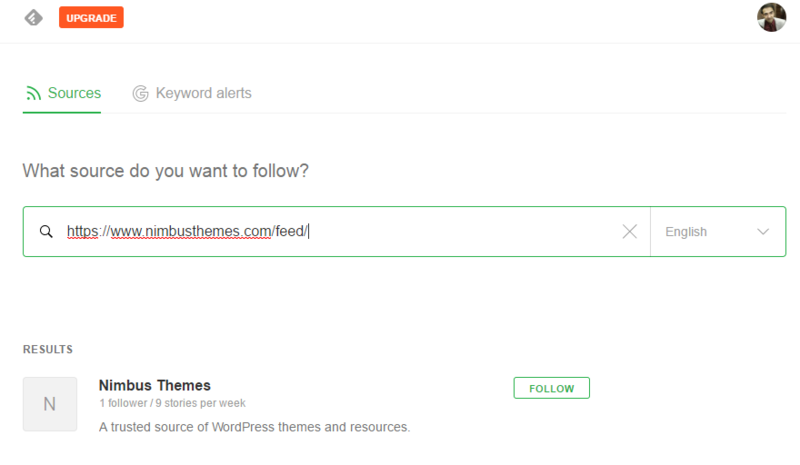 Once your readers have created an account on Feedly, they’ll be able to add your RSS feed simply by searching for your website. To get started, click on the green Add Content button located at the bottom-left of your Feedly dashboard and then clicking on Sources. In the following screen, your readers will be able to search for your RSS feed by entering your website’s name or the RSS feed URL in the search box. Even though WordPress automatically generates an RSS feed for your blog posts it doesn’t mean that you can’t customize it. In fact, there are a number of ways you can customize your RSS feeds simply by adding code snippets to your active theme’s functions.php file. And if you’re not particularly programming literate then you can just as easily install a WordPress RSS plugin to help you get started with a step in the right direction. What Are Some of the Best WordPress RSS Plugins? WordPress doesn’t come with RSS feed templates right out of the box. Those of you who want to modify the RSS feed on your WordPress site will need to edit the core files. Of course, there is an easier way around this – you can use some of the best plugins to get the job done in a few clicks. If you are looking for a powerful and flexible RSS plugin then WP RSS Aggregator is the best option for you. This lightweight plugin can display, import, and merge RSS feeds with ease on your WordPress site. The free version of the plugin lets you add as many RSS feed sources as you’d like and receive updates from them directly on your WordPress website. In addition to this, the plugin lets you configure all kinds of settings. For instance, you can choose to only import feed items with unique titles. It also lets you open YouTube, DailyMotion, and Vimeo videos directly. You can also blacklist selected items so that they never get imported again. The premium version of the plugin includes add-ons that can help you create auto-posting sites. Allows you to import a large number of feed items from different RSS feeds. Enables you to display feed items by using display functions from within the theme. Limit the number of feeds stored per feed source by their age. Choose to show or hide meta data of each feed item. Use shortcodes to style the feed items menu display. RSS Post Importer is a great content syndication plugin for WordPress websites. It fetches the RSS feed and publishes the entire imported content of each feed item as a standalone post. This plugin lets you import RSS feeds from similar blog niches and share relevant content with your readers. If you’re thinking about setting up a content aggregation website then the RSS Post Importer plugin is a great choice for you. Allows you to add backlinks and excerpts. Advance statistics allow you to add pie charts for feeds items distribution bars and other advanced charts. Use simple format templates for formatting imported content. Add the no-follow tag to all outbound links for better SEO. As the name suggests, this WordPress plugin allows you to present a menu with multiple RSS feed subscription to your site’s visitors. You can add this to your site along with your usual RSS subscription option. Many viewers don’t subscribe because of the absence of the RSS feed categorization especially if the site covers multiple topics. The Category Specific RSS feed Subscription plugins lets you tackle this by allowing your readers to subscribe to up to eight different categories. Allows you to add RSS feed for different categories. Use shortcodes to create RSS feed menu for the tags on the blog. Enables you to use a tag cloud with the RSS feed of each tag. Tag RSS feeds can be used for specific articles to show the RSS feed of each specific article. Enabling RSS feeds on your WordPress website is a great way to help your site’s readers stay up to date with your latest blog posts. WordPress comes with RSS technology right out of the box. All you have to do is configure your RSS feed preferences and promote your feed’s URL. And when you want to kick things up a notch, you can install an RSS plugin to get better control over your RSS feed’s customization. Do you have any questions about getting started with RSS in WordPress? Let us know by commenting below!